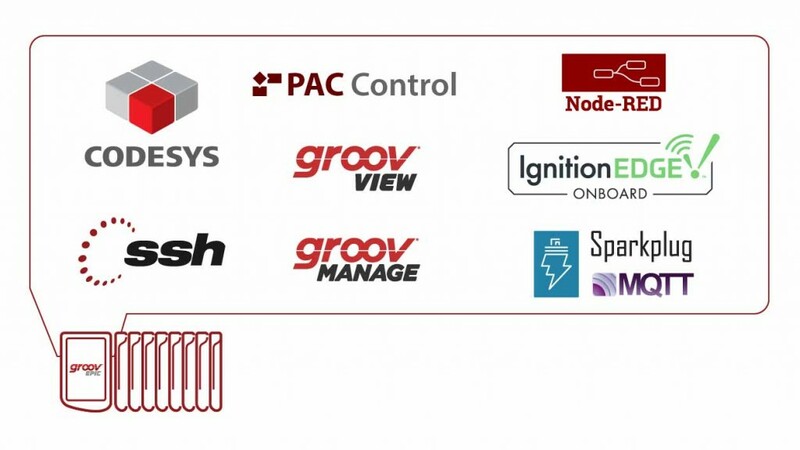 "As the world's leading manufacturer of independent IEC 61131-3 software," stated Markus Bachmann, President of the U.S. subsidiary of the CODESYS Group, "we are excited that CODESYS has been chosen to boost Opto 22's groov EPIC to the next level in industrial automation products, integrating state-of-the-art industrial control with new IIoT and Industry 4.0 applications." In addition to IEC 61131-3, groov EPIC can also be programmed using Opto 22's native PAC Control. Field-proven, flowchart-based PAC Control with optional scripting offers 400+ plain English commands for analog process and digital sequential control, complex math, conditional branching, string handling, and other complex functions. Unique in the industry, groov EPIC integrates the easy-to-use HMI software groov View with its control programs. Once an IEC-61131-3, PAC Control, or custom software application is developed, the control program's tags and I/O are available for building a groov View HMI. Data from other systems and equipment on premises, at remote locations, and in the cloud can also be included in the HMI. The drag-drop-tag HMI construction is quick, security is built in, and trending and user notifications are included. Based on Opto 22's 45 years of experience as an automation manufacturer, the groov EPIC system merges tough industrial hardware with open protocols and standards to provide an ideal system for both automation and IIoT applications. Built to withstand conditions at the edge of networks in factories and remote locations, EPIC is approved for use by UL in hazardous locations and is ATEX compliant. EPIC can be used to collect, process, view and exchange data where it is produced, and this data can then be securely shared among databases, cloud services, PLC systems and other components. In recognition of its unique capabilities, groov EPIC won the 2019 Control Engineering Engineers' Choice Award in the Industrial Internet of Things Connectivity category.